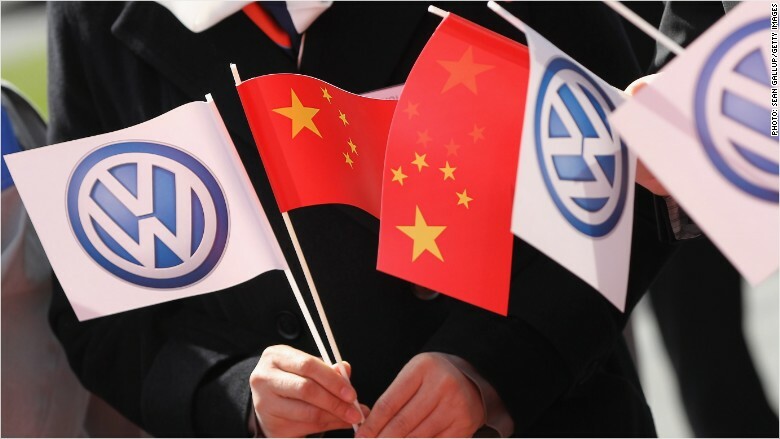 Volkswagen is worried about the world's biggest market for cars -- China. The German company, which is now bigger than Toyota (TM) by sales, delivered 1.7 million cars in China in the first six months of 2015. That's more than it sold across western Europe, but 4% fewer than the same period last year. Volkswagen (VLKAF), which owns 12 brands including Audi and Porsche, downgraded its forecast for group sales Wednesday and warned of an "increasingly difficult market environment." It now expects sales to match last year's record 10.1 million vehicles, having previously forecast a "moderate increase" for 2015. Growth in the Chinese market for passenger cars slowed significantly in the first half of this year, the company said, and even went into reverse in June. Slowing truck sales due to tougher emission standards and a more modest pace of investment are also clouding the outlook in China. Related: Will China's slump sink Europe's recovery? The Chinese economy grew by 7% in the second quarter, in line with expectations and the government's target pace for the year. But crashing stock markets have raised fears that growth could slow without further interest rate cuts and other stimulus. Volkswagen faces problems in other markets too. "We are keeping a very close watch on global macroeconomic trends, especially where there are uncertainties such as in the Chinese, Brazilian and Russian markets," said CEO Martin Winterkorn. Group car sales in Russia slumped 39% in the first half. In Brazil, they were down 26%. Strong growth in Europe and north America more than compensated for weakness in those emerging markets -- group revenues were up 10% at 109 billion euros ($120 billion), but investors were clearly troubled by the outlook. Shares in the company fell by nearly 2% in Frankfurt, while the broader German market was flat.